Springsteen & I -- My interview with the director of the "crowd-sourced rockumentary," which will be back in theaters Tuesday. Joe Leydon: Badass Critic -- I have a new title, thanks to the people who made Bad Kids Go to Hell. 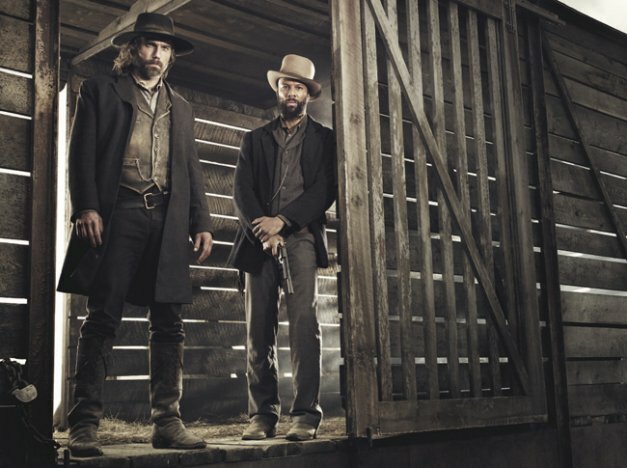 Hell on Wheels -- Anson Mount and Common (above) are back in the saddle again. The World's End -- I previewed the new Edgar Wright film -- but I couldn't say anything about it. Longmire -- No, not that Robert Taylor. This Robert Taylor. QFest -- They're here, they're queer, and they're screening all over the Greater Metropolitan Houston area. The Attack -- Director Ziad Doueiri talks about the Arab League ban of his film -- and considers the subversive potential of bootleg DVDs. Swoopes -- I talk to a couple of hot babes -- WNBA legend Sheryl Swoopes and ESPN host/correspondent Hannah Storm -- about the movie they made together. As my dear, departed father might say: Hey, at least it keeps me out of the poolhall. Godzilla is coming! Godzilla is coming! Helen Mirren rocks in "stripper shoes"
Machete is back, and Fantastic Fest has got him! John Wayne: "The hell I won't!"